For more than a decade Gary Chamberlain has been empowering youth to keep America beautiful by not littering in their schools, community and country. His efforts first started in Arizona and have continued to his new hometown of Murphy, N.C.
"Our youth are our future, and by engaging and encouraging them to make a difference in the future of our country through their anti-litter efforts, they can see that they can make a difference in their community," said Chamberlain, a member of American Legion Post 96 in Murphy. "We are trying to encourage our youth to develop pride in themselves, their school, their community and their country." Chamberlain speaks and works with schools in Cherokee County to educate them on the importance of not littering due to the harmful impact it has on the environment and economy. He passes out anti-litter brochures and stickers as a reminder. Chamberlain said he is proud of the county’s principals, teachers and student participation in the anti-litter movement who have made a difference in the community through their actions. Since 2016, the students have helped pick up about 195 33-gallon bags of litter. And Chamberlain alone has picked up 560 33-gallon bags. Trash removal occurs four times a year on the third Saturday of February, May, August and November. Another way Chamberlain engages the students to keep America beautiful is through an anti-litter contest that involves the students answering questions about why it’s important to not litter and creating anti-litter posters. The posters are posted on Chamberlain’s North Carolina Litter-Free Coalition Facebook page and voted on. "When it comes to litter, there is something for everyone to do and sometimes it’s as simple as saying thank you to those making a difference or just being a ‘Do Not Litter’ messenger," Chamberlain said. Martins Creek School won the North Carolina Litter-Free Coalition Anti-Litter Contest during the 2016-2017 school year. The school held anti-litter discussions in each classroom that generated enthusiasm from the students, said principal Paul Wilson. "Students became interested in teaching parents and family members about the importance of picking up litter, and more importantly, the importance of not littering in the first place," Wilson said. Last September, the school held a campus beautification day where parents, students and others picked up litter on school grounds and planted flowers. Other ongoing cleanup efforts are in the works, such as at sporting fields. 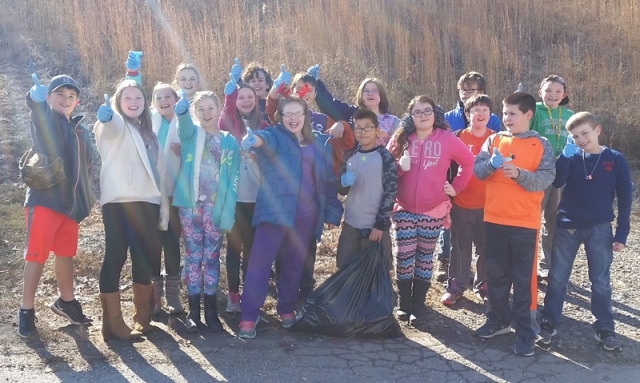 "For Martins Creek School, these efforts are about more than litter. They fit under the umbrella of producing virtuous students, our primary goal," Wilson said. "The greatest virtue is humility. Leaving refuse behind in the stands at a game or along the roadside is a concrete example of what it means to be inconsiderate of others. The most important goal is to train students to be virtuous and act responsibly. Everyone stands to benefit if we are successful, both now and for generations to come." U.S. Army veteran and vice principal Keith Payne of Murphy Middle School, who also participates in the anti-litter efforts, said, "Anti-litter efforts start with one person and if that one person can affect change in two more people, and those two people affect change in two more people, we have seven people. If those seven people find two more people each, that trend continues until everyone will soon understand that to keep America beautiful isn’t just a dream, but a realized reality." Chamberlain encourages other American Legion posts and schools to join in on keeping America beautiful. And he is available to help support in those efforts. Chamberlain can be reached by email folksvilleUSA@gmail.com, phone (928) 202-1186 or write to PO Box 98, Murphy, NC 28906.